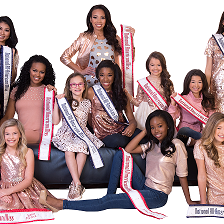 QUICK JUMP: Contestants Pageant Information How to compete in National All-American Miss 2017? The 2017 National All-American Miss pageant concluded with Keisha Abelgas winning the title of National All-American Miss 2017-2018, Serena Sammons winning the title of National All-American Miss Teen 2017-2018, Raven Wright winning the title of National All-American Miss Jr. Teen 2017-2018, Ellie Schmidt winning the title of National All-American Miss Pre-Teen 2017-2018, Ella Osborne winning the title of National All-American Miss Jr. Pre-Teen 2017-2018 and Landry Piller winning the title of National All-American Miss Princess 2017-2018.